We’d love your help. 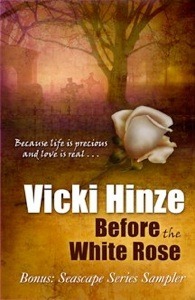 Let us know what’s wrong with this preview of Before the White Rose by Vicki Hinze. To ask other readers questions about Before the White Rose, please sign up. This was incredibly short and sweet, but still managed to deliver an important message of never giving up, something good could be just around the corner. It takes around 10 minutes to finish, but will stay with you a while longer. I think it has the potential to be a long hard-hitting novel if the author ever wanted to expand it, even knowing how it ends I would still read a novel version. This is a very touching story. I,for one,sat back and thought about my own life and how things could be improved. This story dives into the possibility realm and things we might like to not live through. Vicki is a fantastic writer and an inspiration to me. I really enjoyed the story. It is a short story about three lives that come intersecting together in their darkest moments. I think it was a story that needed to be written. It’s a story of hope and despair and the amazing realization that people do come to after being touched deeply by death. Darn, this was too short! I love the message of the story but I won't say what it is because it might spoil it for prospective readers. But the category of the message would be hope. No matter how awful life seems, when it looks like you have nothing to live for, hang in there. Included are excerpts to Hinze's Seashore trilogy. I only read the first because I didn't want to read any spoilers, in case they follow the same characters. The first one is good and I look forward to reading the rest whe Darn, this was too short! I love the message of the story but I won't say what it is because it might spoil it for prospective readers. But the category of the message would be hope. No matter how awful life seems, when it looks like you have nothing to live for, hang in there. The main story in this book takes about 20 mins to read. The other parts of the book are 3 Chapter sneak peaks of this author's trilogy. The main story was okay to me, a bit different than I was expecting. I'm willing to try her other works. I knew this was a short story, but it was SUPER short! I finished it in maybe 10 minutes? I enjoyed it. Maybe because of things that have happened recently in my own life. I did not read the excerpts from her other novels because I have at least one on my Kindle that I downloaded for free. First book "Before the White Rose"; very good, love it. 2nd story .. it was ok, couldnt get into the last story.